The Sonoma County Water Agency is installing a stream gauge on Nathanson Creek at Second Street East in Sonoma downstream of the area burned by the October wildfires, providing real-time data to weather forecasters who are responsible for sending out alerts to residents when flashfloods or debris flows may be imminent. The Sonoma County Water Agency also installed a rain gauge at the site of the City of Sonoma’s Thornsberry Water Tank above Lovall Valley Road. The Nathanson Creek stream gauge is scheduled to be installed between April 13 and April 27, 2018. The gauge installations enhance Sonoma County’s ability to monitor for potential dangers during rain storms and trigger advanced warnings to protect public life and property. This stream gauge on Nathanson Creek is part of a system of 10 stream/rain gauges and 12 rain-only gauges installed in locations throughout the burn areas and along streams within and downstream of the burn areas. The data from the gauges is used by the National Weather Service in developing their hazardous weather advisories, alerts and warnings. 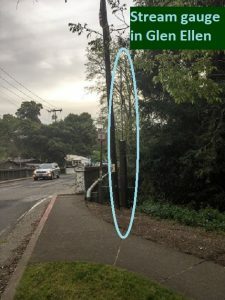 The real-time rainfall and stream flow data is also available to the public at https://sonoma.onerain.com/. Many properties in the areas burned by the wildfires, and downstream of those areas, are at risk for flash flooding, mudflows and debris flows during periods of intense rainfall. Wildfires can dramatically alter the terrain and soil conditions and leave the ground unable to absorb water, creating ideal conditions for flash flooding and mudflows. City of Sonoma Public Works staff and City residents will benefit from this system of gauges that allows them to monitor streams and rainfall in real-time and get a more accurate picture of conditions in areas that are vulnerable to flooding. The system will also start to gather historical flow data along streams, which is critical for stream maintenance and flood control operations. Residents are encouraged to visit the Early Flood Monitoring website to see rainfall and stream levels at specific sites at https://sonoma.onerain.com/. For information about being prepared, visit: https://www.sonomacountyrecovers.org/rain-ready/.